The winners of this game will be celebrating in a hotel room, far away from Volgograd. For now, Leo Messi and Argentina are alive. And it is all down to one Ahmed Musa and his Nigerian compatriots. Nigeria announced themselves in Russia with two moments of magic. Messi will also know from tonight that Nigeria will be no pushover. This is a result that now sets up a barn-storming final matchday to this group. 90 minutes of football up ahead, with nothing decided. The game started with the teams feeling each other out. Nigeria played in a 4-4-2 system, while Iceland used their famous 3-5-2. A really drab start ensued, with the crowd starting a Mexican wave in under 10 minutes, and the Iceland lot revving their team up with their thunderclaps. A half that won’t live very long in the memory, it had a good supply of Aron Gunnarsson long throws and Icelandic balls flung into the box, with no one to meet them. Musa cut an isolated figure, and his link with Kelechi Iheanacho was non-existent. Things livened a touch in the last few moments. A free-kick from Gylfi Sigurdsson should really have been nodded home by Alfred Finnbogason. And that would come to haunt Iceland all right. The second half started at a much faster tempo. Iheanacho released Moses down the right, who played a fizzing cross into the box. Musa took a lovely touch, leading the ball out of the path of Ragnar Sigurdsson. Always keeping it under his spell, he finished on the volley into the roof of the net. Iceland responded, driving cross after cross into the box. Full-Backs Jon Bödvarsson and Hordur Magnusson upped the ante, as Nigeria clung on. Moses continued to remain a menace down the right on the break. While Iceland had the ball and huffed, Nigeria got rid upfield in a hurry and caused plenty of problems. A fierce drive from Musa smashed the crossbar around the 74-minute mark. And a few seconds later, Musa was fed down the left flank, from a clearance. Kari Arnason was shredded for pace, as Musa burst inward. Taking the ball past Halldorsson in goal, Musa smashed the ball with aplomb into the net past two men on the line. The game was all but done. A late sting in the tale lay, as Tyronne Ebuehi and his clumsy tackle, were retrospectively punished by VAR. From the ensuing penalty, Gylfi Sigurdsson blazed over. The remaining 10 minutes was borne out easily enough by the Nigerians, to spark scenes of joy at the end. A number of individual performers emerge. Victor Moses and his up and down running off the right flank proved decisive. Iheanacho grew steadily into the game, finding his feet in the second half after an absent first. Iceland had plenty of industry, from Gunnarsson and their Full-Backs. Aside from his penalty, Gylfi Sigurdsson was always seeking to make the right passes and had quality dead ball delivery. But his costly miss at that juncture will be the talking point living in the memory. The star man is the match winner. Two sublime finishes from Ahmed Musa made the world sit up. One cannot wait to see him against Messi and Co. His ice-cool finishing, electric movement and presence make him a player to get you off your seat. 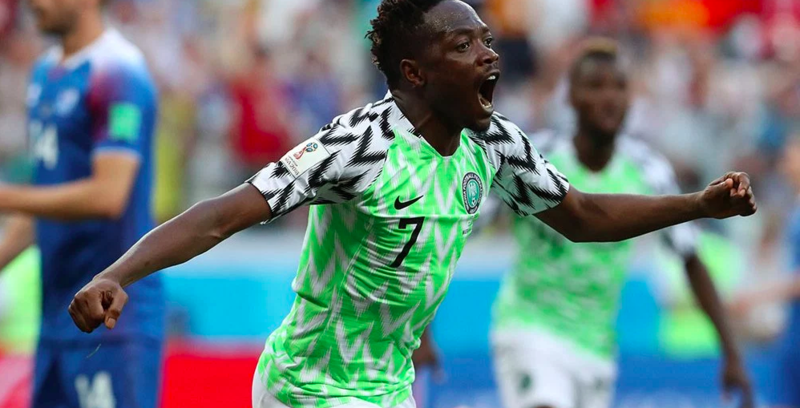 Ahmed Musa now has 4 goals at the world cup, only Asamoah Gyan and Roger Milla have registered more for an African team. He has also registered Nigeria’s last 3 goals at the world cup. Nigeria have their destiny in their hand, but Argentina and Iceland remain in the hunt. Francis Uzoho is now the second youngest keeper to keep a clean sheet in the world cup, at a mere 19 years. 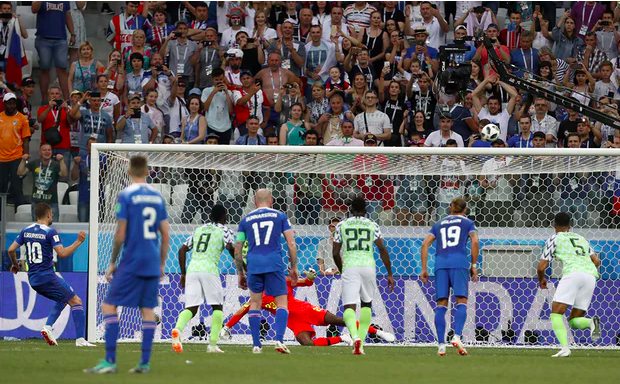 Nigeria failed to have a single shot on target the first half, but registered their first within 14 seconds of the second. One needs more than a few breaths to reflect not just on the game, but what it means for the group. The statisticians will draw up a huge range of situations. But every team barring the already through Croatia has something to play for. Iceland will feel hurt and dejected, but there is no time to mourn. They will play a rotated Croatia and must believe in their ability to pull a result out the bag. Argentina and Leo Messi have a chance now, but the way they’ve played so far isn’t a great confidence booster. The likes of Musa will relish going up against the suspect Argentine defence, in a thrilling game. Who knows, it might all come down to goal difference. 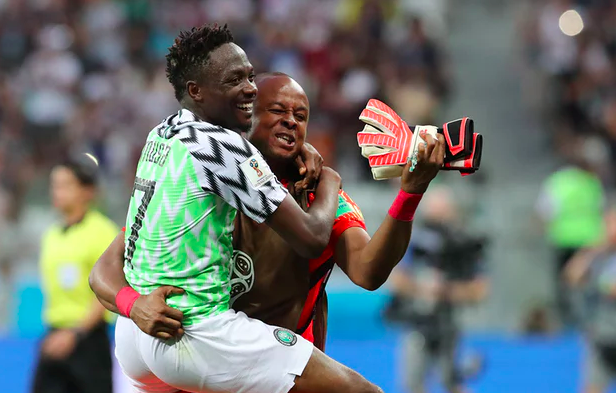 But for today, we celebrate Musa and the brilliant Nigerian team who pulled up their socks at halftime and gave us not just a thrilling half of football, but also a cracker final match day in group D.